It's popular to argue that average Americans are abandoning democratic principles. But what if they're simply fed up with political elites? What should we make of these warnings? Is it true that ordinary citizens are beginning to devalue democracy? That they’re warming to authoritarianism and stoking a crisis of democratic legitimacy? But while rampant racial and economic inequality, political polarization, and institutional gridlock have created a cocktail of dysfunction, this growing alarm overstates the pessimism of citizens’ attitudes toward popular government — and misunderstands some of the problems ailing American democracy. In the 1960s and ’70s, a political scientist named David Easton laid out an influential framework for conceptualizing citizens’ assessments of political systems. Easton distinguished between two types of attitudes: diffuse support and specific support. Diffuse support, he explained, reflects citizens’ feelings toward fundamental aspects of the political system like constitutional order and the value of institutional rules. Specific support, on the other hand, reflects citizens’ evaluation of the performance of particular actors within that system (think Congress or the president). While diffuse support taps into the sort of thick, stable values associated with norms and principles, specific support can fluctuate wildly based on prevailing events. This distinction is useful when thinking about the value people assign to democracy. Consider the following illustration, which uses World Values Survey data from 2006 and 2011, as well as more recent Bright Line Watch survey data collected in September 2017. 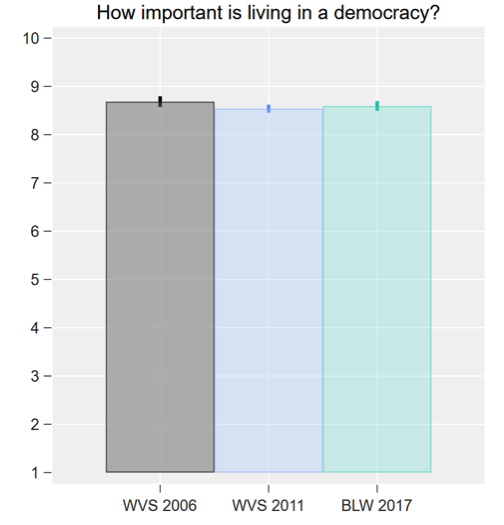 Respondents in both surveys were asked a variation of the question, “How important is living in a democracy?” Next, they selected a response from a ten-point scale ranging from minimally or not important (anchored at zero) to very or extremely important (anchored at ten). On balance, we can see that Americans are reliable partisans of democracy. Across three different presidencies — George W. Bush, Barack Obama, and now Donald Trump — they’ve graded democracy well. Assessing “How well?”, of course, is a more complicated, somewhat subjective question. But it seems reasonable to agree that scores above 7.5 — halfway between the blasé and indifferent “five” and the perfect “ten” — constitute a “good” or “adequate” threshold that conveys acceptable levels of support. By that scoring criterion, the American public remains deeply committed to the institution of democracy. Indeed, the following figure illustrates that almost 80 percent of citizens respond with an eight or better, and less than 7 percent of all respondents offer an answer of five or lower. It’s also not the case that millennials are digging democracy’s grave. The second panel reveals that the average scores given by younger respondents — who tend to be more apathetic about politics and vote less frequently than older Americans — are not only positive but appear to be on the uptick. As a final test of diffuse support, let’s look at the extent to which Americans favor authoritarian substitutes to democracy. First, it is true that in recent research, a minority of Americans have expressed openness to authoritarian alternatives. But in the case of a preference for military coups when corruption is present, the net acceptability of such actions has actually decreased from 2010 levels (I’d also note that forced-choice survey questions can yield strained conclusions). Second, many equate a preference for a “strong leader who is willing to break rules” as evidence of openness to authoritarian rule. That claim is questionable, though — what about citizens who prefer leaders willing to buck oppressive social and legal restrictions on rights? Third, consider that when asked about whether army rule was an acceptable way to run a country, my colleague Kirby Goidel and I found that 85 percent of Americans flatly rejected that idea. The bottom line: regardless of the present occupant of the White House, evidence suggests that support for democratic principles remains high. Diffuse support for democracy remains consistent and robust. But what about specific support, which reflects whether democratic governance is seen as “working?” As we might expect given recent events, Americans are clearly not satisfied with what their political system is producing. Yet even that story is worth plumbing because the data are more nuanced than popular narratives convey. The next illustration explores responses to an item on the Bright Line Watch survey that asked individuals to rate democracy on a scale from 0 to 100, with higher values signaling warmness or satisfaction. These responses were then divided into deciles. 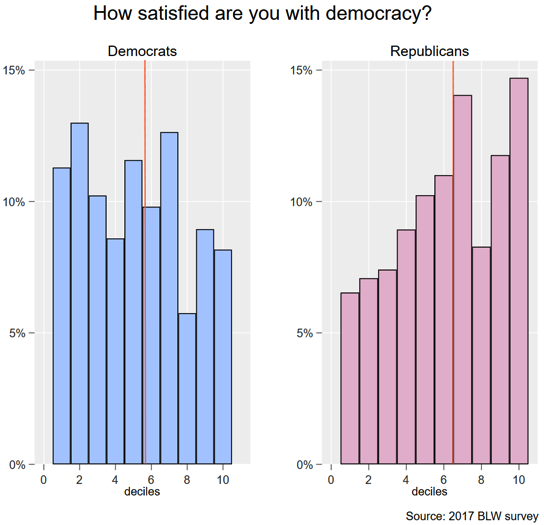 On balance, Republicans were a bit happier with democracy than Democrats, which makes sense considering the GOP’s congressional majorities and control of the presidency. Looking at these attitudes in a broader context, the next graph uses data from Vanderbilt’s Latin American Public Opinion Project (LAPOP). In this case, the LAPOP surveys asked individuals to rate their satisfaction with democracy on a four-point scale ranging from very dissatisfied to very satisfied. Rather than look at Democrats’ and Republicans’ attitudes separately, I’ve coded respondents as “in-party” and “out-party,” which corresponds to whether their party held the presidency. 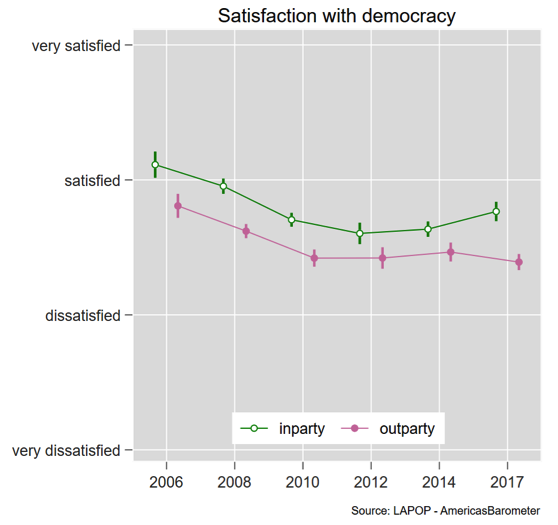 “Winners,” not surprisingly, are happier with democracy than “losers.” But while general satisfaction with democracy decreased from 2006 to 2014, in 2017, people belonging to the in-party (i.e. 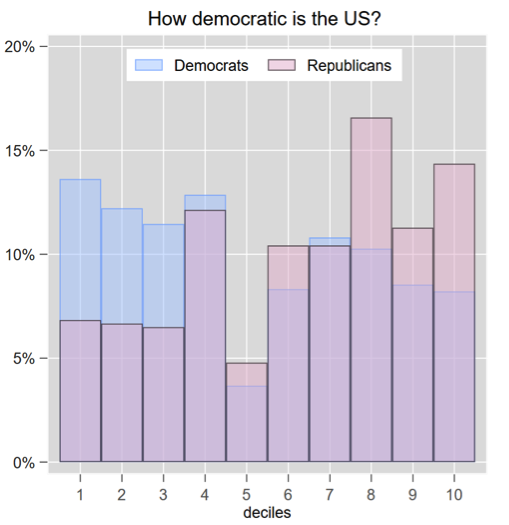 Republicans) were actually more bullish on democracy than Democrats were during the previous three survey years. Nevertheless, given these relatively poor ratings, it’s worth exploring these attitudes in another light. 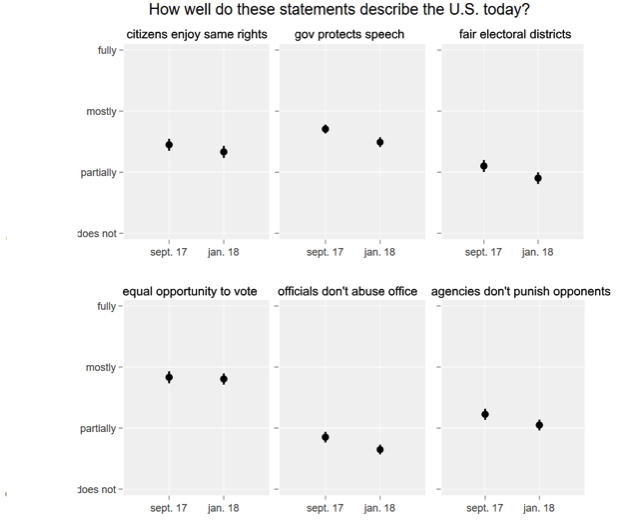 In the most recent wave of Bright Line Watch’s survey, from early 2018, respondents were asked, “How democratic is the US?” Once we account for partisanship, the distribution of scores among Democrats and Republicans is effectively bimodal — that is, responses cluster around negative and positive scores based on respondents’ partisan preferences. The average response is not very encouraging. As such, I want to press in on the meaning of these ratings. Bright Line Watch asked individuals to rate twenty-seven facets of democracy according to whether the United States was or was not meeting its obligations. In the interest of space, I have winnowed these questions down to a smaller subset of six items. 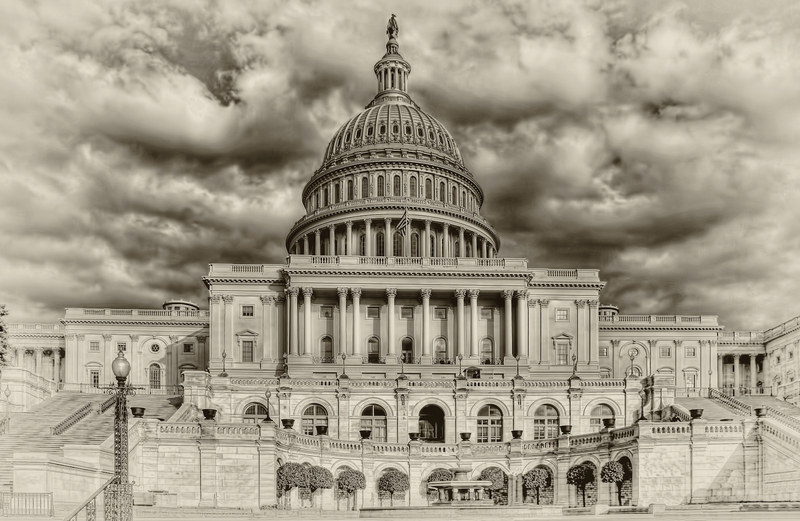 Regarding rights and free speech, respondents convey that the United States vacillates somewhere between partially and mostly fulfilling these obligations. Access to the vote receives higher marks, while the behavior of government officials receives low scores. In thinking about the meaning of these responses, however, it is important to recognize that the question prompt specifically asked, “How well do the following statements describe the US today?” Note that this question does not ask about democracy, per se. 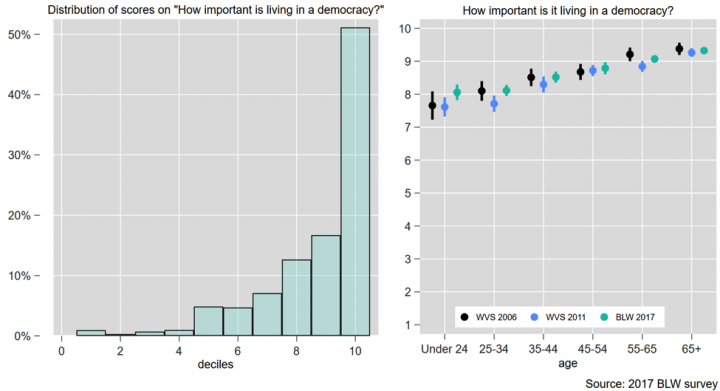 When individuals were asked about the importance of these concepts to democracy, support was remarkably robust. Thus, it seems reasonable to conclude that a lack of perceived democratic-ness is probably a function of specific government outputs that provide less-than-ideal cover for things like public accountability. While these responses are not positive, are they reason to assert that we’re witnessing a wholesale “decline in public faith in America’s democratic institutions”? Not really. Again, it is prudent to distinguish between anger at political elites and jettisoning of democratic values. We appear to be seeing more of the first than the second. Perhaps the most overlooked aspect of Easton’s work concerns the relationship between specific and diffuse support. The value that citizens assign to democracy isn’t fully independent from their views on the behavior of regimes and political elites. Take Greece. After the financial crisis hit, the failure to stem austerity and address mass unrest degraded diffuse support. A fascist party was energized. Although it is distinct from both Greece and other countries that have experienced democratic backsliding, America’s democratic experiment had profound issues before Donald Trump. Slavery, the late enfranchisement of women and African Americans, the horrendous treatment of indigenous peoples, the imprisonment of citizens at record-setting rates, Gilded Age–level inequality, mass shootings, outbreaks of virulent racism, political gridlock — all mar the American polity and shape how individuals think about and assess democracy. And even if what we are experiencing now under Trump is not “normal,” it’s important to qualify public opinion regarding democracy. There is palpable unhappiness over politicians’ failure to respond to a multitude of crises — not a souring on democracy itself. Nothing guarantees, of course, that American democracy will not break. Just because democracy has maintained its (relative) integrity in the past doesn’t mean its survival is a foregone conclusion. Popular government places a premium on accountability, and that accountability is under duress. But we should take care to contextualize what these attitudes mean, much less the implications they have for the wider political system. Or else we won’t be doing the cause of democracy any good. Nicholas T. Davis is a political scientist who studies social identities and the structure of mass attitudes. He’s working on a book about the popular meaning of democracy. Isn’t America Already Kind of Socialist?